I’ll NEVER Tire Of Florals! I don’t remember a time when I didn’t like florals! I’ve always loved them and felt so girly dressed in flowers! 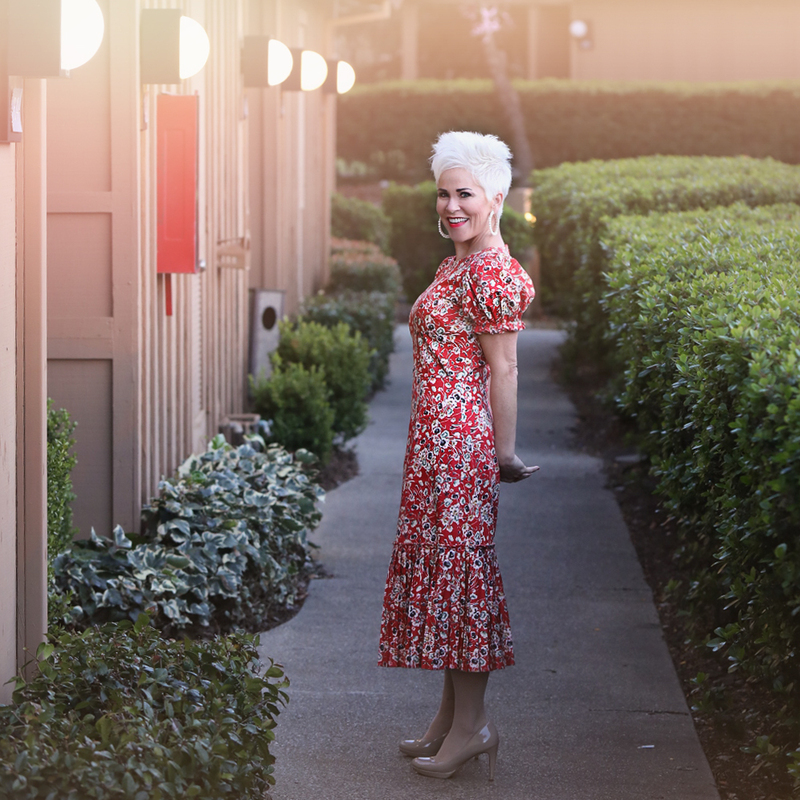 I’ll NEVER tire of FLORALS…..ever! This dress was particular sweet I thought, because it has a pretty vintage feel with the tiny print. Some would say if you want to wear floral everywhere…meaning an ALL FLORAL outfit……to keep the print more on the small side. But, I have broken that rule many times, and I’m petite on top of that. So like I’ve said many times, it all depends. If I’m drawn to something, I always will try it on, no matter the “rules” out there in the fashion world. You just never know what will look good until you try it on!!! Would you wear this dress any season? If so how would you wear it? I think you could absolutely wear it ANY season! And this is how I would do it! During the summer with metallic sandals, fall with a sweater over the top and some dressy-type booties, winter with a fluffy jacket and hat, and spring perhaps just by itself as I have it here. The fabric is just the right weight to be able to take it through the whole year. 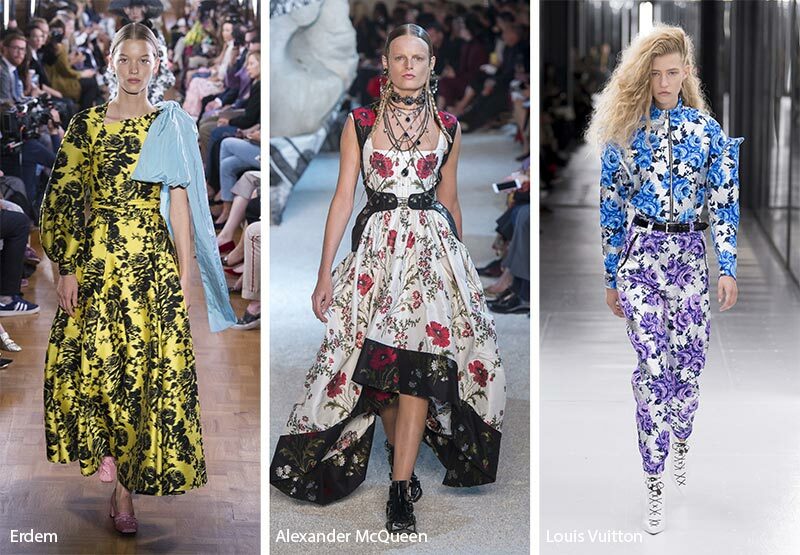 Florals are very much a part of the SPRING 2019 trends! And thank heavens they are. They are the best way to bring in my second favorite season! I LOVED looking through this article on print trends. Take a look at these styles below! Over-the-top BEAUTIFUL I think! That outfit on the right, I would wear in a heartbeat! I think it would look so cute with white pumps! Probably a little much for some, but I would be that one who would try it! One of my favorite ways to wear florals is with some distressed denim! The juxtaposition I think is one of my favorites! I have already started scoping out my favorite FLORAL styles that are available right now, and have them all here for you to start getting excited for SPRING! But in the meantime, don’t be afraid to wear this pattern ALL YEAR LONG!!!!! I love, love the Alexander McQuenn Dress and would wear it in a heartbeat, I love the colors in the Dress. I also love bright colors always have. My Mom used to make my Sisters and my clothes even when I was a Teenager she still made them and we always had pretty pieces to wear. Being from Germany and after the War there was’t a lot of colorful Fabrics to choose from or a lot of money either so she did what she could and I’m so grateful for everything she did for us and I hope she knew that.Stay busy Shauna and Thanks for all you do. That dress was made for you!!! If you were a dress THAT would be you!!! I would wear it exactly the way your wearing it…taking center stage. I’m a little skittish about color, and throw in a floral pattern….well, let’s just say it would be an anxiety attack waiting to happen. I may try floral in a skirt this summer with a neutral shoe and top??? Ease my way? ?